One can adapt to lack. Tell me of zone defense and I’ll tell you of the great divisions of the earth’s surface: Frigid, Temperate, and Torrid. Our poet-speaker proves herself a master-archer. She tells us forthright: “I believe only in the discrepancy between what is/and what is said.” These poems strike, slice, and skewer that interstice. Bullseye!, time and again. The title poem acquaints the reader with a Victorian custom from which the book’s three sections—THIMBLE, RING, and ANCHOR—derive. “Wedding pulls” refer to charms baked or iced into a wedding cake, which unmarried guests draw out of the cake as portents of their romantic and pecuniary fates. I love in particular the concrete imagery of this poem, its shot-through quality that resembles lace. Here I see a handkerchief (“old” and “borrowed” perhaps) that a vintage bride would tuck inside her sleeve. Daniels uses the caesura’s sonic pause, which is also its visual gap, to cast white shadows of doubt across the page. The “what-might-have-been-if” haunts each hole, leaving the subject-turned-reader to wonder: if I had pulled a different object from the cake, whose riches and affections would now be mine? I love also that this poem announces, with unabashed delight, Daniels’ probing and playful relationship to language. She’s having fun riffing on her own phrases—“ring me up dear” becomes a new way to say “getting married” (perhaps a twist on the popular lyric, “put a ring on it”), and words like “dear” /“year” and “scorn”/“forlorn”/”born” are rhymed deliberately and internally to create a looping effect, sounds calling to their sound-mates across time and space. the image floating up from the emulsion. his sad story: estranged, expelled from his father’s esteemed estate, etcetera. It cannot be coincidence either that this poem about the biblical First Couple—the mythical First Marriage—is arranged in couplets. Another bullseye!, Daniels’ unflagging union of content and form. is exacting, what is eternal, what everlasting? Now I can’t un-see the “earn” in “earnest” (which sounds like “urn,” so there is a little death in it, too…), the way one who is earnest learns she must earn her keep. and then the exit [escape]. Behold how Daniels has streamlined the poem sonically—and in so doing, elegantly compressed all our associations with Eve. Behold how the prelapsarian world is penetrated again, anew, by the knowledge that is language—we watch it happen right before our eyes—as everything comes to a swift, incisive head: “We existed (or at least I thought we did)./What a difference a day and an s, well-placed, make. Exit/exist. I hear these words in one other now as echoes, fraternal linguistic twins. Perhaps the “s” is analog to the rib, what separates Adam’s exit from Eve’s existence, both of them expelled for shared and separate crimes from the Garden of—yes, another e-word—Eden. As a reader of wide-ranging tastes, what satisfies me most is a poet whose vision I can trust. Daniels’ poetry is piercing and propulsive, and in every poem, she strikes a target I had not expected to hit. In fact, she finds bullseyes! where I had not even perceived a board. dress addressed, a red awry. A wry grey adored. ments and administrations. Aspersions and aspic. A tone, a meant tone. Atonement: cold meats on a platter, the placating cheese (there is no excuse). Attraction a traction. Ask again and I’ll stay. My colleagues in fiction often speak about “statements of theme,” occasions in a story or novel where a narrator reveals the larger intention of the work. Daniels’ statement of theme appears in the form of a question, one that pierced me deeply: “Is there a sentence/ you regret revoking?” Not a sentence you regret (which spurs its own contemplation), but a sentence you regret rescinding, retracting—in other words, that which you took back but should have let stand. 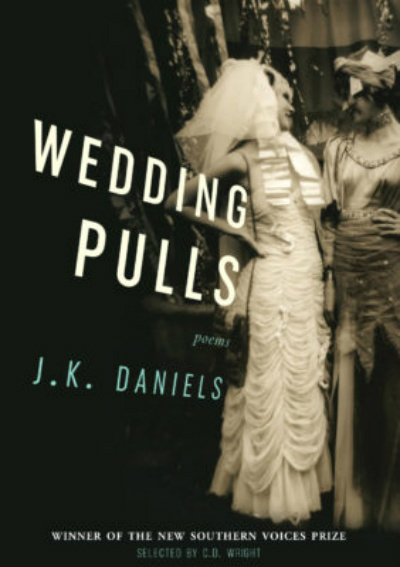 Wedding Pulls is a sinuous knitting of all those sentences mistakenly revoked, coerced apologies and mumblings under the breath, confessions scribbled onto pages that were later torn or burned up. Now, poised in the art-field, this poet-speaker returns with her quiver, her language-arrows sharpened to their finest points, and lets them loose (picture their glorious arc!) toward a fortress of convention/tradition/binary logic/anti-ambiguity. She strikes religion, history, literature, film, visual art. She parses language to its shrouded core. At the end, our poet-speaker declares, multi-valent as ever: “I am, as you have/ always found me, wanting.” Who doesn’t dwell in this dual state of deficit (wanting) and desire (wanting)? Prepare to be cleaved by this book.